And there are useful garden tools. Then there are useless garden tools. This post will show you how to invest in the first two, and avoid the last one. You don’t need to spend alot of money. Just invest in good quality versions of the seven essential garden tools, then build up others gradually as you need them. And if you haven’t had a good tool sort-out recently, now is the time to winkle trowels out of trugs, scrabble in the backs of shelves for secateurs, rootle around in the potting shed for hand forks and search all your nooks and crannies for stray gardening gloves. They need their annual clean-up. And it’s time to chuck those bent forks and dinky little painted trowels, and get yourself a set of garden tools that really work. I asked the experts at Harrod Horticultural for their definitive list of essential garden tools for a happy gardener. Jo Blackwell, their Kitchen Gardener says that a spade, a fork, a rake, a hoe, a hand trowel, a hand fork and a good pair of secateurs will do all the garden basics. There are links to tools which you can buy from Amazon, via my affiliate programme. If you buy via Amazon, I may get a small fee, but you won’t pay any more. I only recommend products that I’ve tried myself and think you’ll like. Almost all garden tools have varying sizes which suit different jobs better. I have a Ladies Spade (similar to what is sometimes called a Border spade). This is a smaller light spade for people who can’t dig with a bigger spade. It’s also a useful spade for digging up a plant in a confined area, such as a packed border. So you could have a full size spade, and ladies/border spade. 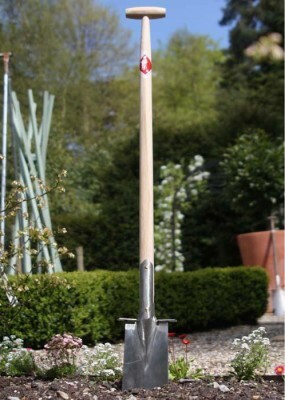 A Ladies Spade (£87.95) from Harrod Horticultural. Similarly, you could also have a full-size rake and a hand rake (much praised by Andy McIndoe of My Online Garden School in my ‘Christmas presents for gardeners’ post). And, of course, you need loppers and shears for some garden jobs. The best shears I’ve ever handled are my Niwaki shears. From around £70, they’re not cheap but so easy to use. Spending so much on them makes me treat them reverently – I certainly don’t leave these sprawled on a damp lawn just because I’ve had to rush in to answer the phone. For tips on pruning, find out the absolutely best way to prune lavender, and how to prune trees for privacy and light. And do visit Great Dixter one day. I visited in February, when pruning is key to creating the wonderful borders later on in the year. Pruning is at the heart of why it’s such a wonderful garden – you can improve your pruning with 10 Great Dixter pruning tips they told me about. So what else is worth buying? If you want to expand on your gardening basics, then see my post on The Best Garden Supplies for three great weeders. A pruning saw (£35-£159) is then the next choice – but if you get someone to help you with your pruning ( I do), then they will bring their own tools. The biggest mistake when choosing tools? I think she’s under-stated it – when it comes to hand forks and trowels for gardening, you could easily say “buy cheap and buy five times”. And it’s not just irritating when a hand fork snaps – you can hurt yourself. Harrod Horticultural stock a range of tools, including Snoeber. I can testify that we have a Snoeber Long Thin Trowel (£32.95) which is as solid and sparkling as it was the day it arrived (8 years ago), in spite of complete neglect from me. The same cannot be said for a succession of useless hand trowels and forks, from various gift shops and supermarkets – or given away as freebies by garden companies that don’t make tools. How do you spot a poor quality tool? A tool that is painted rather than one which is plain metal is probably going to be of poorer quality. Paint covers up cheap wood and metal. Paint will flake away quickly and the metal beneath will rust. And if the wood and metal is cheap, then the tools themselves are more likely to bend or break. Personally, I think any garden tool with flowers painted on it is probably just gift shop fodder. And price is a clue. Good work costs money. You don’t have to buy lots of tools, just a few good ones. And there are creative solutions: if you want to get really good quality loppers, for example, you probably won’t be using them every weekend, so why not share a pair with a friend? I live in the historic market town of Faversham. 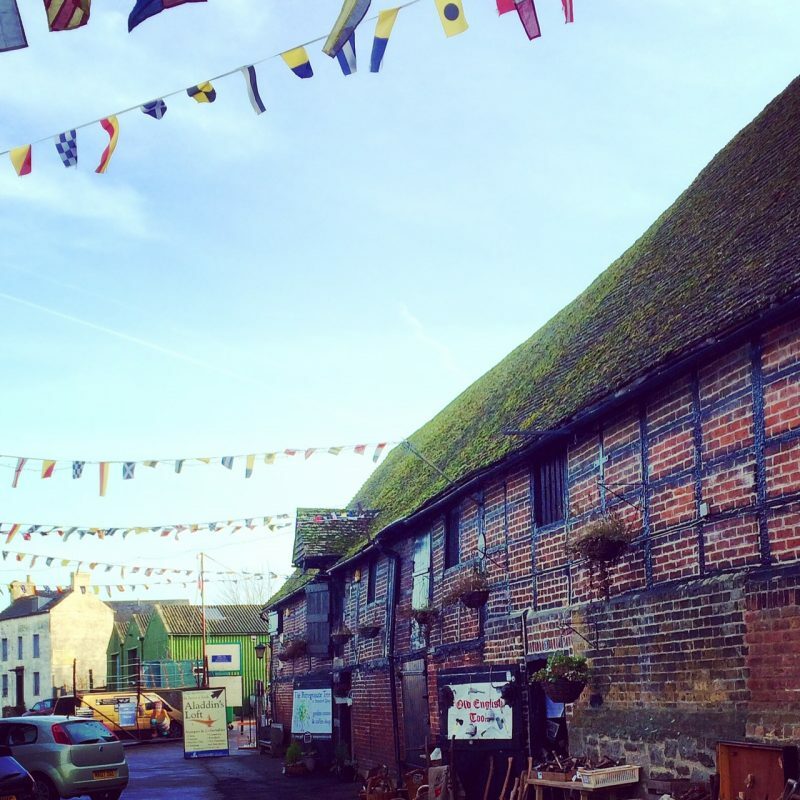 We have markets every Saturday, plus a vintage & antiques market on the first Sunday of every month. And there are lots of vintage/second-hand/charity shops, too, including a vintage tool shop, down on the ancient Faversham Harbour. I also enjoy going to car boot fairs, where there can be some really excellent vintage tool finds. However, prices are going up, as vintage tools are becoming fashionable (although I think they are often used as ornaments now, or as accessories for styling). The vintage tool shop in Faversham is down at the Harbour, in one of the oldest working warehouses in Britain. Most of the tools are workshop-y rather than gardening, but I got a hand fork and trowel, plus a hand rake for £13 the lot. They do seem stoutly-made, although are a little heavier than well-made tools nowadays. Vintage tools look lovely, they are solidly-made and they can be a way of getting good quality tools for less. However, they’re often a bit heavier than many good tools made today, so see how they feel when you hold them in your hand and lift them. Car boot and yard sales could also be a good place to find second-hand tools. Once you’ve bought your essential garden tools, you need to look after them. They will often last for decades if you do. I have asked Mr Middlesize if we have any oily cloths, and he has donated an old cotton shirt to the cause. And Jo suggests linseed oil, which you can usually get from hardware stores (or there is a linseed oil Amazon link at the end of this post). Secateurs are another thing that appear in gift sets for gardeners, but there’s nothing more uncomfortable than using a badly-made pair of secateurs. Secateurs are one of the seven essential garden tools, but cheap ones can tear stems and damage plants. If you have good secateurs, like Felco or Niwaki, it’s really worth looking after them. If you have Felco secateurs, you can send them away to be serviced for £19.99 (includes return postage) by World of Felco. Felco also have spare parts, if the secateurs break, plus lots of information about sharpening and oiling secateurs, which would be useful whatever brand you have. At the other end of the spectrum you have the all-purpose tool, which many gardeners swear by. Fern Alder of Full Frontal (a national community garden initiative to green up front gardens) uses the Kirpi from The Organic Gardening Catalogue (£18.95, pictured below). Does an all-purpose garden tool save you buying all the others? 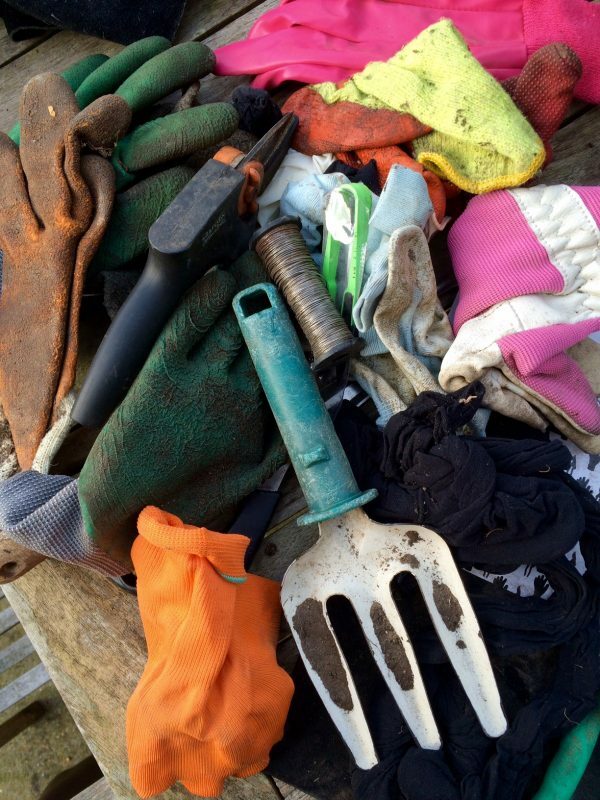 The clear-out has yielded six matching pairs of gardening gloves (a real bonus! ), which I put through the washer at 30 degrees. I made myself throw away several lonesome gloves whose partners had deserted them. Today, I will clean and sharpen everything, ready for spring. 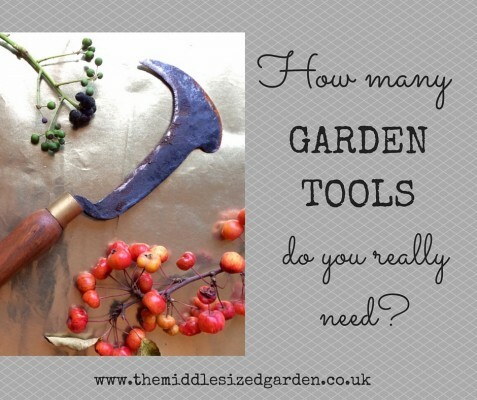 Have I left out any of your essential garden tools? Do leave a comment here, or on Facebook or Twitter. And if you make high quality garden tools painted with flowers, do feel free to leave an enraged comment…thank you! I do quite alot of my digging with a hand trowel - it feels better for my back somehow. I use a hand trowel where many would use a spade - it takes a bit longer but you get there in the end. Paying a bit extra for a strong trowel like this is really worth it - I hate trowels that bend as soon as they have to deal with our heavy clay soil. I think I probably use my hand fork more than any other garden tool - it's so useful when weeding, planting or dividing plants. Often called a 'border spade' or a 'ladies spade', this spade has a smaller head, which makes digging easier, especially if you have a bad back. I find any other size of spade completely impossible - far too heavy - to use. If you're very fit and want to dig up a very large garden, you'll probably want a full size spade. But smaller head also does the job, so unless you're digging up acres and acres of garden, you'll be fine with it. This size fork is invaluable in any garden. It's particularly useful if you have a compost heap - jam the fork deep into the compost heap, then work it round in a circle with the handle. It's an excellent way of getting air into a compost heap if you don't have the strength to fork great lumps of compost up in the air. Also very useful for all planting. I do love my Felco secateurs. I've had a pair like this for longer than I can remember - decades probably. Other secateurs come and go. These seem to go on forever, and you can have Felco secateurs repaired and serviced. A hoe is a classic piece of garden equipment, and very useful for weeding between rows of vegetables. I don't tend to use it in flower borders so much, as there isn't the bare earth you get in the early season on veg patches. If you don't grow vegetables, you might manage without a hoe, but it's also a good way of loosening the soil if you sow seeds directly into it. Linseed oil keeps tools from rusting. Keep a bottle of linseed oil and a clean - or relatively clean cloth - in the tool shed, then give your tools a quick wipe at the end of every day. They will last longer. 22 comments on "7 essential garden tools to make your gardening life really easy"
Great call on pruning tools, thanks for sharing! The Felco Secateurs are a great buy. I used them to shape up a small bush in my back garden where I could take some time to decide which shape I wanted. The Secateurs were so easy to use too as have had similar products in the past where you need to exert a lot of effort to cut with. I think one important point about any tools is always buy the best that you can afford, they will last longer. That goes for your gloves as well. For high pruning of tall trees and shrubs I can highly recommend the Darlac Expert saw and anvil pruner. The two items are swappable with different length poles – although I’d only recommend the 4.9mtr pole if you really need the height – the 3m pole is heavy enough to use, the 4.9mtr pole needs a lot of strength to lift and use. Having used cheaper versions that lasted a couple of seasons at best, I’ve been delighted with this set up, and the saw with optional handle will saw through logs better than most bow saws. Obviously check whether you’re in a conservation area or whether a tree preservation order limits what you can do, and equally importantly if in doubt as to your abilities call in a tree surgeon! Very good advice – it is particularly important not to try to cut very high branches unless you know what you’re doing. Interesting to hear about the Darlac, thank you. –	put weeds in the bucket and then take it to the compost. –	Load it up with dirt / mulch / rocks to transport to a place a wheel barrow won’t reach. I absolutely agree – I hadn’t considered a bucket to be a tool rather a useful piece of equipment (is there a difference?). Really good list of things to do with a bucket! But for me, I found a wheelbarrow to be a must for my garden along with these tools! I wear latex gloves underneath normal gardening gloves. Double benefit – they keep you extra warm and dry in winter (i garden in the north of scotland so this is of prime importance! ), help prevent mucky hands / nails, and you can whip off the heavier gardening gloves to do a finer/ less mucky job (or answer the phone or whatever!) and still have hands (or your phone) protected. I so agree! I shall add a box of Latex gloves to the list. I couldn’t garden without them, thank you for reminding me. I can just confirm that It’s not worth buying the cheapest tools out there. I´ve been buying a lot of gardening tools and, yeah.. Cheap ones does not last. The copper trowel sounds beautiful. But, as for slugs – a friend sent me a photo of a piece of copper she left out in her garden (I’m not sure what it was). A few weeks later there were actually about a dozen snails sheltering on/under it…so I haven’t been convinced as to the copper/snails argument for a while! I’d add a pruning saw (I think I use this more often than loppers). I also like my little hand hoe (aka onion hoe) for small areas like raised beds.. I’ve not seen the hand rake before but that looks like a useful tool. Thank you – yes, I had been wondering whether a pruning saw might be one of the essentials. I don’t personally use one, but I’m thinking of putting it on the shopping list. If there is back breaking ground breaking to be done there is no substitute for the digging hoe used widely in Africa and Americas. Very effective and the “physics” is better than the spade. They are very cheap at a well known online bookshop. Interesting! I have just looked it up on the ‘well known online bookshop’ and it certainly looks quite different from anything we British gardeners use. Thanks for letting me know. Absolutely brilliant – gorgeous photography. I would add to the good secateurs and gloves – GOOD gloves. I was given a pair of soft, waterproof, comfy gloves (brand forgotten) for Christmas – and they are heavenly. A blog in itself! Oh, yes, definitely good gloves. I really like Showa, and also use latex surgical gloves for lightweight work, although they shred when faced with anything even remotely thorny.